Right now, Harbor Freight Tools is offering 20% off one item with code 15280564. Some exclusions apply. Customers can also take 20% off any single item with the coupon on this page through March 31. Harbor Freight Tools is a discount tool and equipment retailer that sells quality tools at bargain prices. From generators to hand tools, no matter what equipment you need you’re almost certain to find it at Harbor Freight. The store has over 1,000 locations nationwide and offers a 100% satisfaction guarantee on its products. In addition, it also offers a lifetime warranty on all hand tools. There are a few easy ways to save at Harbor Freight. First, check out the store’s monthly savings ad. There you’ll find the store’s best discounts on hundreds of items storewide. You can also subscribe to Habor Freight’s email list for free coupons and exclusive offers delivered right to your inbox. 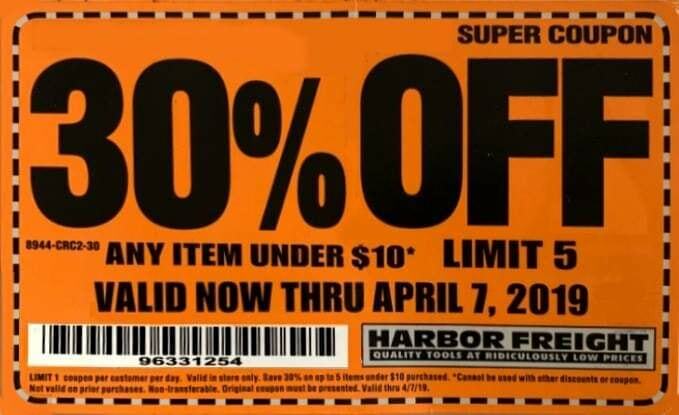 How often does Harbor Freight offer coupons? Harbor Freight offers coupons almost all the time. So, if you’re shopping at Harbor Freight, be sure to see if there’s a coupon available for your purchase before you checkout. You can see a full list of the stores most up to date coupons here.